President Ronald Reagan argued that the only special interest that should be protected by the tax code is the taxpayers. This is a principle that Iowans for Tax Relief will continue to fight for during the upcoming legislative session. Iowa needs economic growth and the best way to create economic growth is by decreasing government spending, lowering tax rates for all, and reducing the regulatory burden. As we approach the start of the legislative session it is encouraging to hear that tax reform is at the top of the agenda for many legislative leaders. This is especially true after President Trump signed the Tax Cuts and Jobs Act that will help allow Iowa policymakers to enact meaningful tax reform. 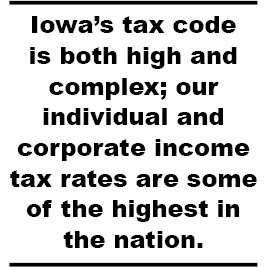 Iowa’s tax code is both high and complex; our individual and corporate income tax rates are some of the highest in the nation. Iowa taxpayers are long overdue for fundamental tax reform that will provide relief for all taxpayers. In formulating tax policy, the legislature should make sure that any tax policy is fair, that is, the tax code should not favor one group of taxpayers at the expense of another and it should make Iowa more competitive. The tax code should encourage economic growth and lower rates will allow for greater economic incentive and competitiveness. Iowa is not only in competition with a global economy but also with other states. Some of Iowa’s competitors such as Michigan, Indiana, and Wisconsin are enacting meaningful tax reforms that are creating economic growth within their respective states. The legislature should also keep in mind that taxes need to be limited and that taxes are to be used only to finance the essential functions of state government. It is immoral for government to believe it has an unlimited claim to the hard-earned income of individuals and businesses. Iowa’s tax code, and all other aspects of government, should have the goal to promote and protect freedom. The tax code should not be used for social engineering. Recent arguments regarding levying a tax on sugary drinks and raising the tobacco tax should be opposed. Advocates of these tax increases argue that it is in the interest of obtaining revenues to fight obesity and other health concerns, but the question must be asked how successful government can be in changing behavior? Can the state make someone lose weight or quit smoking by increasing a regressive sales tax on people? Taxes must also be transparent. The legislature should review all existing tax credits, including the relevance, duration, intent, and effectiveness, to ensure they are serving Iowa taxpayers. Iowa has numerous tax credits and taxpayers deserve to know these credits are working in their interest. Once again, a more competitive tax code with lower rates will allow less reliance upon tax credits by making Iowa more economically competitive. Perhaps the most difficult task for the legislature will be the budget. Iowa continues to suffer from a tight budget situation caused by lower than expected revenues. As the legislature considers the budget for fiscal year 2018-2019 it needs to prioritize spending on the necessities of state government. The legislature must start to address spending and the best plan of action is to support the general fund expenditure limitation amendment. This amendment (SJR 9), which passed the Senate last session, would strengthen the 99 percent spending limit already in Iowa’s code. The proposed constitutional amendment would limit the state’s annual spending to the lower of 99 percent of estimated revenue or a four percent increase from the prior year. A fiscal analysis conducted by the Legislative Services Agency found Iowa would have spent $488 million less since fiscal year 2012 if this amendment had been in the state Constitution. The principles of lower tax rates, spending, and regulation are proven to work. States across the nation that have lowered tax rates and kept spending in control are seeing progress in economic growth and opportunity. Iowa has a historic opportunity to enact meaningful tax relief that will allow Iowans to keep more of their hard-earned income and allow for greater opportunities and growth for the state. Michael Tanner, a Senior Fellow at the Cato Institute, recently wrote, “regardless of where one falls on the political spectrum, one should expect two things from government: basic competence and a healthy respect for the taxpayers’ money.” This is what Iowans for Tax Relief will be fighting for this legislative session and for years to come.